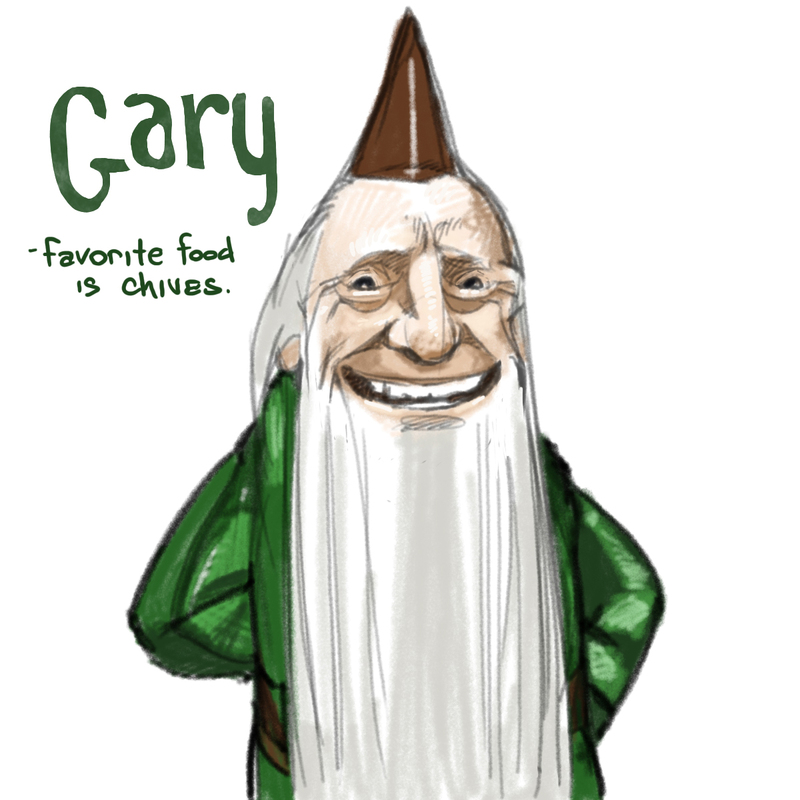 Quick with a smile and a story, he is often surrounded by the gnome children. In his younger years he starred in the villain's role in most of the gnome plays (his strong chin makes him look like a heroic human). Favorite food is chives. I'm going to use my best idea right away and vote for Algernon. Gregory Grinth is the Minister of Parks and Forests, as noted by his green shirt. He wears a small cap because it gets caught on the trees less easily. His beard is so long because years ago he had a fight with the gnome hairdresser, and they haven't spoken since. Gary. There is only one name for that gnome, and it is Gary. Ooo, Ooo! I like gnaming games. I agree with @Chris. Gnaddlehopper is quick with a story and a smile. You can find him, the constable, the tailor, and several farmers every morning down at the local diner sharing stories about politics, weather, sports, and when they were younger gnomes. If you get the chance, sit for a spell. The food is hot, the company is great, and every one of them would rather lose their right arm than not help someone who's a good listener. Why the small hat? Years ago he had a spat with his good friend, the tailor, involving putting on a few ounces--poppycock. The tailor jokingly made his clothes way too small, so Gnaddlehopper began wearing the hat, showing it to everyone, and telling them it was the tailor's best work. His name is most definitely Buford. He has a secret power that is activated upon wearing sunglasses: He becomes the secret member of ZZ Top. Gorff. He loves his little hat. Nate I will tell you the story later. He hates formal occasions, having to wear hates, and having his picture taken. oh,and its hats, not hates. i wonder what he's so sheepishly holding behind his back. My brother says Alf (short for Alfred). That's not a gnome, it's my high school drama teacher. And his name is Norman. I have no idea where he got the hat.